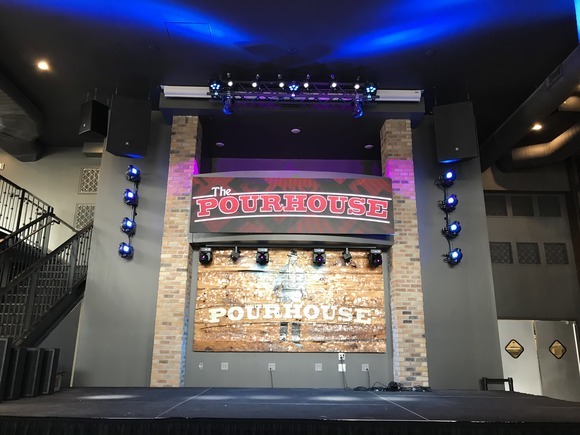 MINNEAPOLIS—Systems integrator Alchemy Sound & Vision recently outfitted popular Minneapolis bar and venue Pourhouse Uptown with a complete networked audio and lighting system by HARMAN Professional Solutions. First opened in downtown Minneapolis in 2012, Pourhouse offers a unique atmosphere that combines live bands, DJ dance parties and screenings of major sports games. With its recent opening of Pourhouse Uptown, there are now three Pourhouse locations thriving in the Minneapolis area. In order to facilitate a range of entertainment and ensure consistent performance across all locations, Pourhouse hired local systems integrator Alchemy Sound & Vision to install a networked audio and lighting system in their recently-opened uptown facility. Alchemy selected a range of JBL speakers, Crown amplification, BSS audio processing and Martin lighting solutions to provide Pourhouse Uptown with exceptional audio, immersive lighting and intuitive system control. One of the biggest challenges the Alchemy team faced was distributing powerful sound throughout the venue without disturbing residents in condos above the venue. The HARMAN system at Pourhouse Uptown features two JBL PD6322/95 precision three-way speakers and two JBL STX828S dual 18-inch subwoofers. Alchemy also included six JBL AC299 and four AC895 compact two-way loudspeakers to deliver uniform clarity and coverage to the far side of the room and balcony level. Crown CDi DriveCore Series, DCi DriveCore Install Series and MacroTech I Series amplifiers supply transparent and reliable power to the entire system. Stewart utilized the built-in all-pass filters on the CDi Series amps to match the phase response of the AC299 and AC895 fill speakers to the mains, delivering consistent balance and tonality throughout the venue. This combination of speaker selection, placement and tuning provides a powerful and focused audio experience for the audience, without bothering the upstairs neighbors. For stage lighting, Alchemy installed a range of Martin lighting fixtures, including the new RUSH MH 10 Beam FX, to deliver high-intensity lighting on the stage. The team also included a Martin Magnum 2500 Hazer, THRILL Mini Profile and Compact PAR 64 fixtures. Alchemy’s goal was to supply Pourhouse with a completely integrated and networked system that would deliver an optimized audio experience in a wide range of scenarios without requiring a trained technician to operate during all open hours. To achieve this, Alchemy designed the system around the BSS Soundweb London BLU-100 signal processor to provide simple network control over all audio inputs and system volume. This allows Pourhouse staff to easily switch between audio signals from satellite radio, the DJ booth or live band stage. Alchemy also included a BSS BLU-BOB1 break-out box to provide additional analog outputs to the JBL speakers.